Someone fill in my memory if you don’t mind: was the last Old School set $150 for the 30 sticker set? Thought the last set of 30 was $50 and was stretching reasonable value at that. I cannot fathom this. Thanks. I put the information on OLDS 7 on the Wacky Packages Wikipedia page and I wanted to make sure that I got everything right. Thanks. I put the information on OLDS 8 on the Wacky Packages Wikipedia page and I wanted to make sure that I got everything right. Thanks. 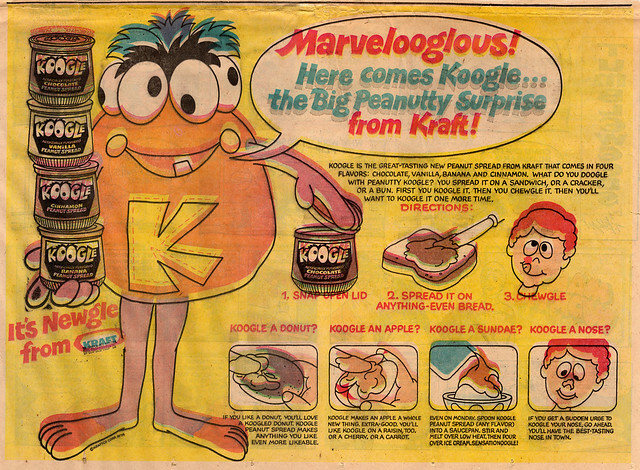 I figured that Koogle wasn't around anymore, but I wasn't sure. Wait, you've got it all wrong, Patrick. I just updated the Wikipedia page by putting in the general information on the current release, not a checklist. Look up the page and see for yourself. Patrick's point was that you wrote "OLDS 8" in your post, when you meant 7....right? Yes, these are the exact same prices and set up as the last set with the only change being puzzles and checklists are on the other side of the rough cards. They sold almost no $50 offers last year. I was surprised that was even going to be an option this year. The set sold out on day 3 of a 7 day sale. The set for $150 is all 30 cards plus 3 sketch cards plus a big amount of Ludlows, tans and rough cards as well. So not just the 30 cards. Noted and fixed. Did not even see that until now. Totally went over my head. Thanks. Is it a nine-piece puzzle checklist, or checklists and puzzle pieces done separately? And are there both black and red Ludlows as well, or just black ones? Dave said that the puzzle pieces and checklists are on the backs of the rough cards. As for ludlows, last time there were both red and black, so presumably there will be both this time. Topps would be be well served to at least mention on their site that this release contain puzzle and checklist cards. That would help sales. AND they should do a chase or bonus printing plate on selected orders - mix it up a bit - i saw black lud reed lud white And tan back also never showed the rough or its back and an empty sketch card TOPPS IS THE FREAKIN WORST AT MARKETING AND YES BACK IN THE DAY $30 a box - 3 boxes got us 3 sketches and a ton of variation WITH A BOX INCLUDED AND A SEPERATE PUZZLE so $90 - need that back SLOPPS = no stars Nuff said!! I thought it was more like $50 per box. The Ben Creeper Wacky mask on the OS7 Wacky almost resembles Archie Andrews of Archie comics fame! What does the Underoos spoof look like if it spoofs a superhero or cartoon character? Underoos painting from a concept by Paul Harris with rough art by Brent Engstrom. The only way to get them to lower the price is to not buy it. Then you risk Topps just pulling the plug on Wackys altogether. I'm surprised by the $50 set too. I don't know who would only want 10 cards from the base set, and buying 3 doesn't guarantee that you'd get 30 different. I suppose it's to fill the void when the $150 sells out -- if it does. I'm shocked how low last year's Old School sets are selling on eBay. I've seen base sets, even complete black Ludlow sets sell for under $50 over the last few months. I consider myself fortunate to have been able to get a complete Pencil Art set for $45 recently. So if you needed to spend $150 last year to get one base set, a few sellers took a huge loss or waited too long to sell them. Maybe they made up for it by selling their sketch cards, tan backs or red Ludlows early on? Yep, the only way there will be more Old School (and any other WP online/ On Demand sets) is if this sells out (or gets close to it I suppose). Yeah, I don;t get the $50 option at all. A while back during the popularity of Wacky packages all new series 3, I noticed you did a rough spoof of the board game "Clue", called Glue. Out of curiosity, is that the same Clue parody in the new 7th Old School series? Yes, reworked to a 1970s version of the game. This painting was around the longest amount of work I ever did on a painting. That's sad and scary if these don't sell. Not too many Wacky Packages fans out there like there used to be I guess. Old School is the closest thing we have today to the quality of vintage Wacky Packages. Yes, things are pretty tight concerning Wacky Packages. Anything they put out needs to sell well to keep things going. There are some other things in the works that look good though. As long as it's cool ideas I think they will sell. They need to avoid the award show stuff and things like that that didn't have much appeal. I know it’s been mentioned before but the wacky Packages/Mars attacks crossover cards seem to do really well. Really would be fun to take the original 16 series and give each card the Mars attacks twist. Would probably sell really well. Create a 9 card puzzle/checklist and forget about variants. I think I'm losing it. Correct me if I'm wrong, but I thought for OLDS6 there was a $50 option that included only the 30 sticker set (no ludlows, roughs, or sketches) and the $150 option that included the set along with luds, roughs, and 3 sketches. But for OLDS7 the $50 option is basically just 1/3 of the $150 option. Who would even want that? Am I misremembering what was offered for OLDS6? the $50 option is exactly the same as last time - simply 1/3 of the Deluxe set. they really should be selling a set option like you indicate, just the base 30 card set, and somehow get the puzzle and checklist in with it. they do this for the baseball team sets all the time. A no-frills team set, and a deluxe version with autographs. There should be a new mars/wacky release soon, so I'll post more as soon as I have anything to report. Make sure they get the sketch cards down right and offer them to the best people. That's a key thing. Also that WP/Mars Attacks Set was one of the highest non-sports in demand sets. Hopefully it will be bigger this time! Thanks! Must have been wishful thinking on my part that there was a $50, no-frills set last time. Maybe I was thinking of what the going rate seemed to be on ebay for such a no-frills set. I hope there is sketch cards for attacky Packages! I want in!